How To Refill Vladdin Vape? Cartridge: Fill your e-liquid in the pod / cartridge as per instruction. Insert the cartridge into the device. Refill the cartridge when it’s empty. Turn on / off: This device is built to function when you take a draw and rest when you leave it alone. Charging: Connect the cable to the micro-USB port on the bottom of the VLADDIN device and the other end, to any USB port. The indicator light on the device will stay on in white while it's charging, and will automatically turn off when fully charged. 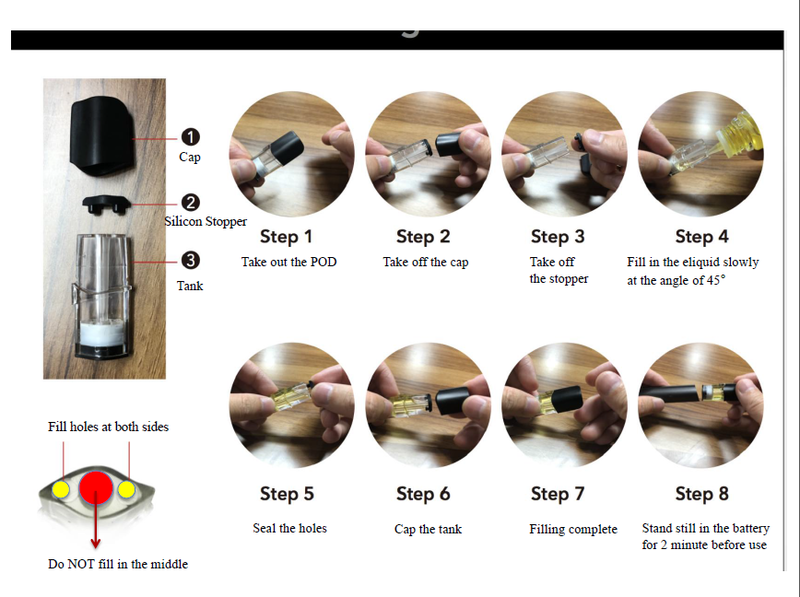 In order to minimize leakage, please pay attention to the following items when filling your e-liquid in the pod. 4. Both fill holes must stay open while filling the e-liquid. 1. The cartridge of this device is refillable. Please fill the cartridge with your e-liquid before use and refull when it’s empty. 2. For your best experience, the number of cartridges used is no more than 3 times. 3. This product battery should not be treated as household waste, instead it should be handed over to the applicable used battery collection point for recycling. 3. Do not try to disassemble the battery or expose it in extreme temperature. 4. This device is intended for use after you fill e-liquid in the cartridge. If you come into direct contact with such liquid whilst using this device please wash your hands and forearms thoroughly. Exposure to such liquid can be harmful if it gets into your eyes, in which case flush your eyes with water and seek medical attention. If swallowed, rinse out your mouth and seek immediate medical attention.When seeking medical advice, have the liquid product container or label at hand. Immediately stop using this device and seek medical advice if you experience any of the following: development of an irregular heartbeat; allergic reaction such as rash, itching or swelling of the tongue, mouth or throat; feeling faint; nausea; headache; or any other unusual or adverse effect. KEEP AWAY FROM CHILDREN AND PETS. INTENDED FOR USE BY ADULT SMOKERS OF LEGAL SMOKING AGE. NOT FOR SALE TO MINORS. The following warning applies only when the product is used with nicotine containing e-liquids. This product contains nicotine which is an addictive chemical and a dangerous substance. This product should not be used by minors, non-smokers, women who are pregnant or breast feeding, or persons with or at risk of heart disease, high blood pressure, diabetes, or taking medicine for depression or asthma. Best Refillable Pod Mod Review By -happy vaper In the last article, “Best Pod System for THC/CBD E Juice,” we took a look at the Asmodus Flow and Vapedynamics Cora. The Flow was a prototype and had a few problems, as one would expect. The Cora was a nice first find but I took it on vacation and found myself won of MOAR! So we continued our search for the Best Refillable Pod Mod to fill even the hungriest of appetites with Wax Liquidizer infused THC E Juice. The Vladdin RE Ultra Portable The Vladdin is a 112mm long and 19mm wide refillable pod system. It uses a 350Mah battery and magnetic connections to attach the pod. It is auto draw so no buttons to deal with. The pod mod charges via Universal micro USB and has a short circuit and low voltage protection. The kit comes with a battery, 1 x pod, and a nice USB cable. The battery charges quickly and I only had to charge twice for 1 pod. It is small but delivers powerful hits! The Vladdin RE is refilled via 2 port holes in the top of the pod which is closed off by inserting a rubber plug. I always fill using a blunt nose syringe as it is small enough and mess free. Plus, the lines of measurement on the syringe help to avoid overfilling the 1.5ml pod. The top cap-mouthpiece snaps over the plugged portholes ensuring no leaks. I have carried this system in a very hot car, pocket, backpack, first aid kit and purse (not mine;) and had zero leaking. They have a proprietary ceramic coil system that looks interesting and gives great flavor. I get absolutely no spitting. There is a 5-6 second inhalation cut off which serves to prevent you from overheating the coil and juice. Keeping the Best Refillable Pod Mod cool My suggestion for operation is to follow the maker's indirect directions. In other words; take the long 5-6 second puff and then puff again after the shut off rather than 2 seconds, 2 seconds, 2 seconds over and over. Taking smaller, consecutive, non-stop hits will overheat the coil and darken the juice when the juice-level gets low. It seems to be fine when it’s filled, however. I think it has to do with how dry the juice becomes by the end of the pod coupled with too much heat. Discovered that on 4th July when many people were puffing and sharing the Vladdin. Real world testing is a must. Let me say that even though the pod was roasted by several people and the juice darkened at the end of the pod...the taste stayed great! Moreover, once I refilled the pod it stopped darkening the mix. It really is the result of too much heat and too little juice in the pod. Therefore, I would suggest keeping more than ⅓ juice level if the idea of any darkening bothers you. But it is minimal and taste remains good, as it should for the Best Refillable Pod Mod. The Limitless Arms Ply Rock Pulse The Pulse is a great budget minded refillable pod mod. Those attracted to shiny lights and slightly larger capacity pods also will find the Pulse a good time. It is also auto draw and the battery is 380Mah with 8 watts of output. Just like the Vladdin the battery charges quickly even though I had to recharge 3 times to finish the pod. The pods are slightly larger than the Vladdin at 2ml but I would caution against filling to the top in order to avoid spillage. The pods connect to the battery by simply snapping them in. The plastic catch system on the mouthpiece feels cheap but holds it tightly to the pods. Removing the mouthpiece from the pods is a little challenging because the cheaper plastic feels like it may break if one is not careful. In fact, I broke the plastic mouthpiece trying to remove one. Attach a pod to the battery the whole system feels robust. I have had it in the same conditions as the Vladdin and no leaking. The battery/chassi is outfitted with multicolored lights which can be changed by clicking the power button 3 times to enter the mode then clicking once to cycle through the colors. You can also turn the lights off for stealth. I personally like the lights. The higher battery output is for the addition of lights, as the vapor output is less than with the Vladdin. As with the Vladdin, the pods are filled via two portholes in the top, which are covered by a rubber plug. The plug is also very delicate. When removing be sure to remove each plug individually rather than just one and then tug on the whole thing to get the other out. The Pulse has a 10-second auto shut off to help with overheating. Though I have never felt like it gets too hot. Be sure to give the atomizer time to vaporize the juice by inhaling slowly. Fast inhales will get juice in your mouth, as it doesn’t have time to vape. Still, it isn’t spitting out burning hot juice like some other pod systems I have tried. The cloud production and taste are pretty good, especially at the price point. At the time of writing, I see them for $17.95 at Element Vape. Pros Vladdin RE: Sturdy build, no leaking, great taste, great taste (not a typo) PLENTY of clouds, No spitback or flooding, fast universal charging, 2 recharges to finish a pod, small and discreet. Limitless Pulse: Very low price, no leaking, quick universal charging, larger capacity pods (even if it doesn’t look like it), decent taste and cloud production, small and discreet (especially since fewer clouds). Cons Vladdin RE: Though very unlikely, the pods could detach from the battery since it is only a magnetic connection. However, the pod still wouldn’t leak. Limitless Pulse: Fragile Pods (Rubber gasket, Plastic catch and mouthpiece), much lower vapor output than the Vladdin especially given its larger battery capacity and twice the time for inhalation before auto cut off. Final Thoughts They are both great pod systems. I included them both because either would do well. However, the Vladdin is definitely a superior product. The proprietary ceramic gives great taste and no spitback. The hits are big for what it is and the price is still right at $29.99. I have filled a pod 3 times so far and it is still going strong. The battery charges quickly is universal and you must only charge twice to finish a pod. Therefore I crown the Vladding RE Ultra Portable “Best Refillable Pod Mod”! Vladdin RE - Best Refillable Pod Mod You can use code HAVA20 for 20% off! More pods are incoming. I had a problem with one and am waiting on a replacement battery. So will update on those later. Next up we’ll take a look at batteries and mods. Which is best for you? As always, thanks for reading and check back soon for more! Q&A FOR VLADDIN Q: What’s The Difference Between Vladdin vape And The IQO Type Heat-Not –Burn E-Cigarettes Sold On The Market? A: The Heat-Not-Burn Equipment Needs To Heat The Prefabricated Papery Pod To Make Cloud, Smell Terrible, Heat Repeatedly, High Cost Of Charging, Cleaning, And Maintenance. Our vape Applies Atomization Principle To Evaporate E-Juice To Make Cloud, Safe And Healthy. Plug And Play Pods, Easy To Use, Long Standby Time, One-Step Process, One Puff Make You Like It, Three Puffs Make You Love It. need for tedious cleaning and cleaning accessories Q: What’s the difference between Vape and the IQOS type “Heat not Burn” E-Cigarettes sold on the market? A: The “Heat not Burn” devices create a smoking sensation using traditional tobacco cigarettes. Due to the use of tobacco, the IQOS system still creates the traditional smell of cigarettes. In addition, the device requires meticulous maintenance and cleaning accessories. This pod system device atomizes the E-Juice, creating a healthier alternative to traditional tobacco. The pod system is easy to use with a simple one-step process to the enjoyment. Q: What’s The Difference Among Vladdin Pods Flavour? Which Kind Flavor Is Suitable For What Crow? A: With 3 Months Careful Selection, We Finalise On The 4 Western Top Brands’ E-Juice.Original Tabacco For Long Years Smoker; Mixed Flavor For Young People; Mint Flavor For Heavy Smokers; Ice Flavor For Mental Worker. Q: What’s the difference between the Pod flavors? Which flavor is most suitable for me? A: After three months of careful deliberation, we finally settled on four diverse flavors. “Original Tobacco” for classic smokers, “Ice Flavor” for a menthol smoker, “Mint Flavor” for a fresh new minty flavor, and “Mixed Flavor” for an all-around new flavor experience. Q：There’s Nicotine In Vape As Well, Is It Harmful? A：Tar And Carbon Monoxide Are The Main Harmful Substance Which Comes From Buring Cigarettes. Not Nicotine. Nicotine Is A Plant Extract, Present In Vegetables Like Eggplant And Tomato. Within 48 Hours In Body, It Will be Excreted Ou t.The Effect Of Nicotine Is More Like Caffeine In Coffee, Mainly Help To Refresh And Calm. Vladdin vape Applies The 2017 Latest US Nicotine Salt Technology, Greatly Improve The User’s Satisafaction Of Nicotine In The Circumstance Of Decreasing The Vaping Rate. Effectively Solve The Biggest Problem Of Smokers On Traditional E-Cig: Not Enough! Q: Is Nicotine used in the Pod system harmful? A: Tar and Carbon Monoxide are the main harmful substances in using traditional cigarettes, not nicotine. Nicotine is a plant extract, present in vegetables such as eggplant and tomato. Within 48 hours of ingestion, nicotine is flushed from the body’s system. The effects of Nicotine are more similar to the effects a consumer gets from caffeine in coffee. Vladdin applies the latest nicotine salt technology, greatly improving the user’s enjoyment and out performing traditional E-Cigs. Q:Is There High Cost of Use Of Pods Mod? A:You Can Vape 450 Puffs (±50 Puffs)On Each Pod, Amount To 2 Packs Traditional Cigarettes. And You Can Use One Pod For 2-5 Days, Average Daily Cost Is 2 - 4 USD, Just Like Traditional Cigarettes. With The Experience Effective More Clear, Vape Amount Gradually Decrease, The Use Cost Will Be Lower. What’s More, The Harm Reduce Of E-Cig Is More Than 95 %,Healthy First Always. Q: How are the costs associated with using the Pods mod? A: Each pod mod contains roughly 450 puffs, equating to about two packs of traditional cigarettes. With average usage each pod can last two to five days, amounting to 2 - 4 USD per day. The E-Cig reduces the harm rates of traditional cigarettes by more than 95%. Q: How many times can be used for Refillable Pod? A: For your best vape experience, we recommend that the refillable pod be used no more than three times.